Tom Curtis serves as a Departmental Specialist in the Office of Health Policy and Innovation at the Michigan Department of Health and Human Services (MDHHS). In this role, he is responsible for establishing, administering, and evaluating Michigan’s State Innovation Model (SIM) demonstration project. 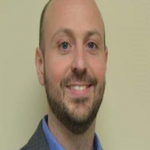 Tom worked previously as a Senior Quality Analyst with the MDHHS Managed Care Plan Division, where he developed performance improvement partnerships with Medicaid health plans. Before that, Tom served as a project coordinator with the MDHHS Division of Chronic Disease and Injury Control, where he developed and implemented clinical-community linkage initiatives. Tom worked for many years on local community engagement and organizing efforts before joining MDHHS, including serving as the Chair of the Ingham County Community Health Center Board of Directors (FQHC) and secretary of the Ingham Health Plan Corporation Board of Directors. He holds a Masters of Public Administration degree from Central Michigan University, and was elected to serve as a trustee on the Mason Public School District Board of Education in 2014.